Anyway, that's my rant, and it can stay right there for now. 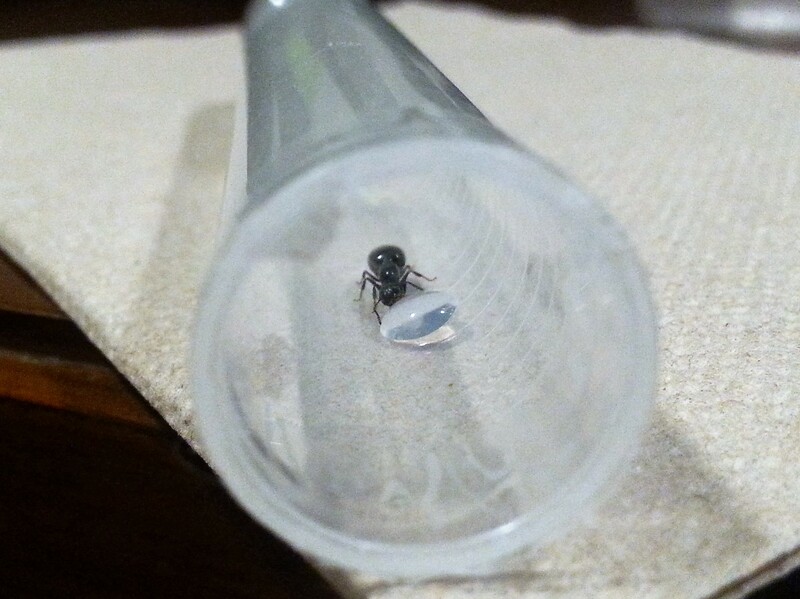 The same season, towards the end of August, I also caught three Lasius Neoniger and one unidentified queen. 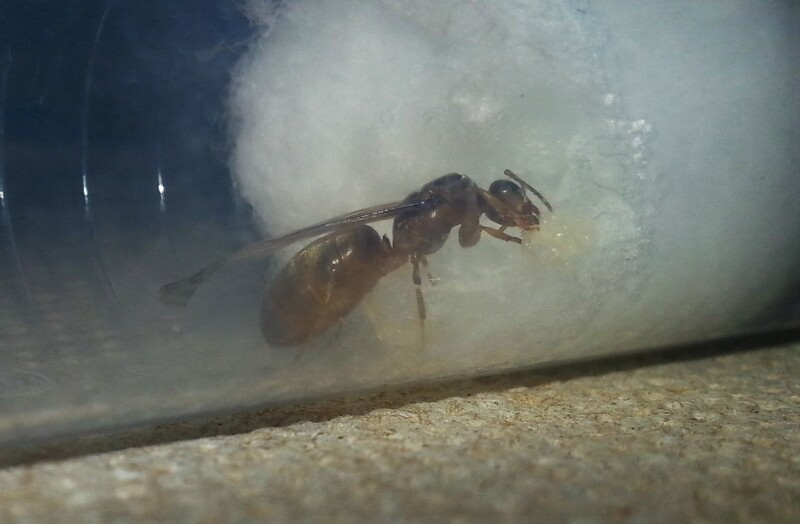 All but one L. Neoniger queen survived hibernation . Here is the beginning of their journals! I hope you enjoy! These are my starting three! I will keep updates when new news hits! P.s. Feel free to take your shot at IDing queen 3#, I'd greatly appreciate it! 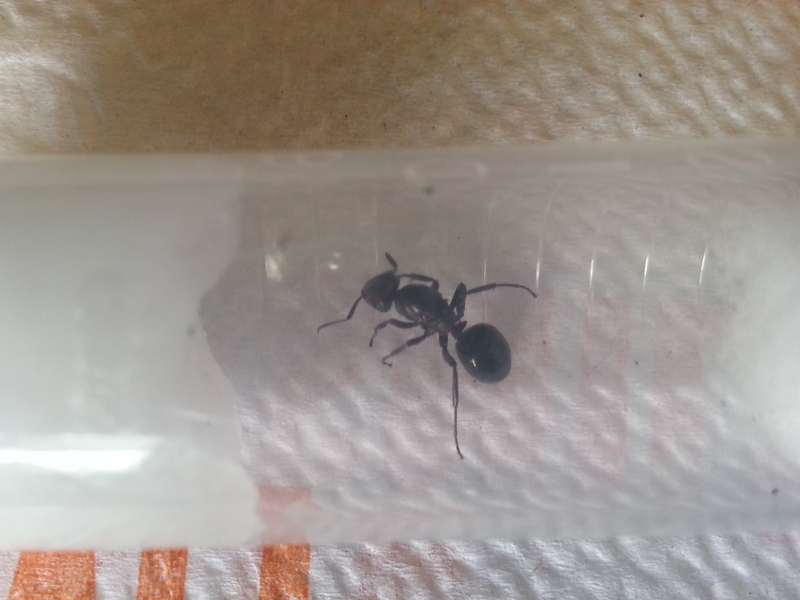 Thank you, Ants4fun, for helping me narrow the unidentified queen to Crematogaster sp.! 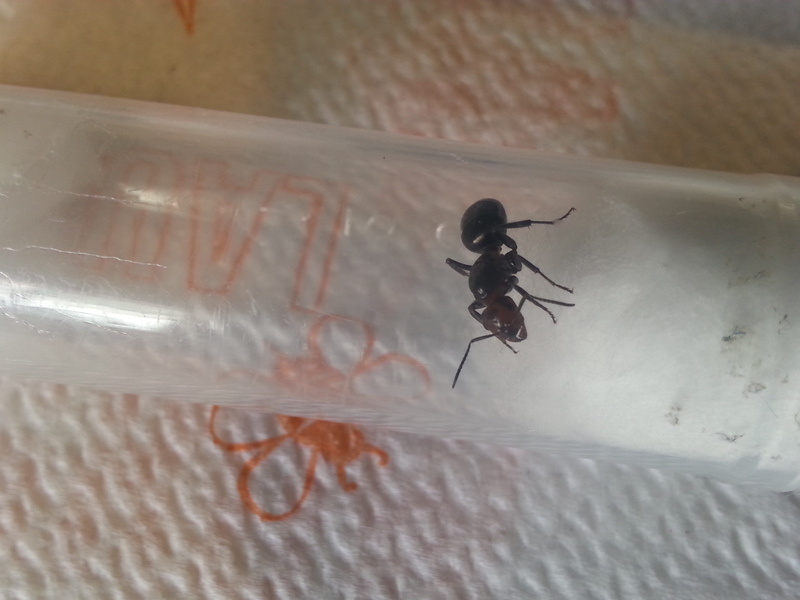 After that I was able to figure out that she is a Crematogaster cerasi queen! - The winged queen still hasn't taken off her wings - she is keeping them for good luck! I couldn't get a very good picture of her through the test tube because it is cloudy. She is tending to her clutch! Thank you for reading! I will keep an eye on them for the next few weeks and we will see if anything interesting happens! Oh boy, it has been a long time. The good thing is I have news! 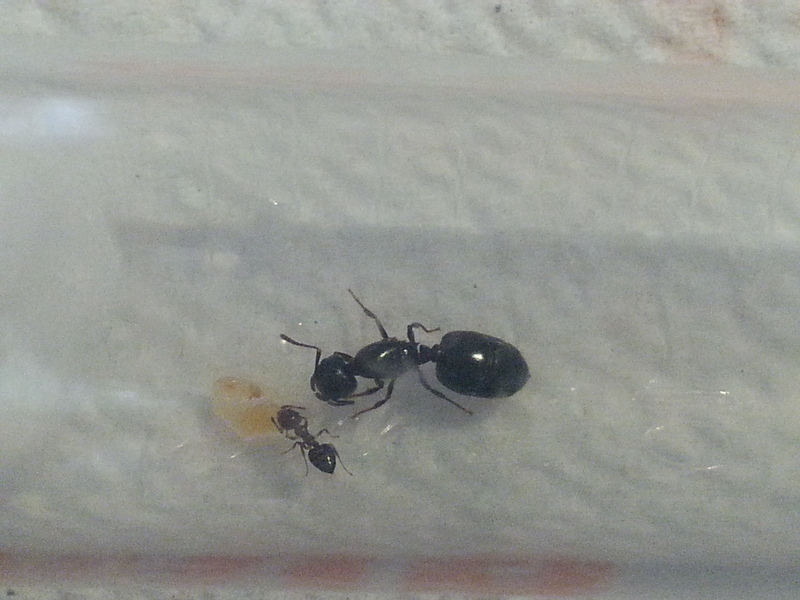 First off, my Crematogaster cerasi queen is now my Crematogaster cerasi colony! Last week, the first worker arrived. 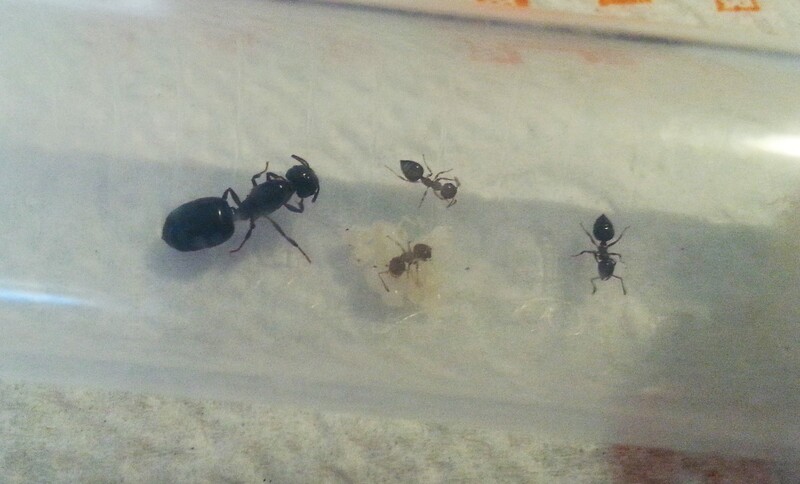 I have 6 workers in this colony now and lots of pupae, which is a promising sight! When they had 4 workers (about 3 days after the first) I gave them some sugar water for their sugar source and some protein in the form of peanut butter. Here are some pictures! You can see one worker is noticeably lighter than the others. This is because she is very young. Two days ago, I decided to feed them again. They had 5 workers at that time. I mashed up some chicken with tweezers and gave them a piece the size of a pinhead. One worker gladly took the meat and toted it around, as if to show off her prize . She took little rests to chew the food. They filled up on the sugar water and chicken and I haven't fed them since. Workers give the protein to the larvae, which have the chewing power to break it down enough to digest. Then the workers are shared some of the processed protein, but they don't need as much because they do not grow. They eat most of the sugar the colony brings in. My wingless Lasius neoniger queen has had a couple pupae for a few days, so I expect them to eclose soon . 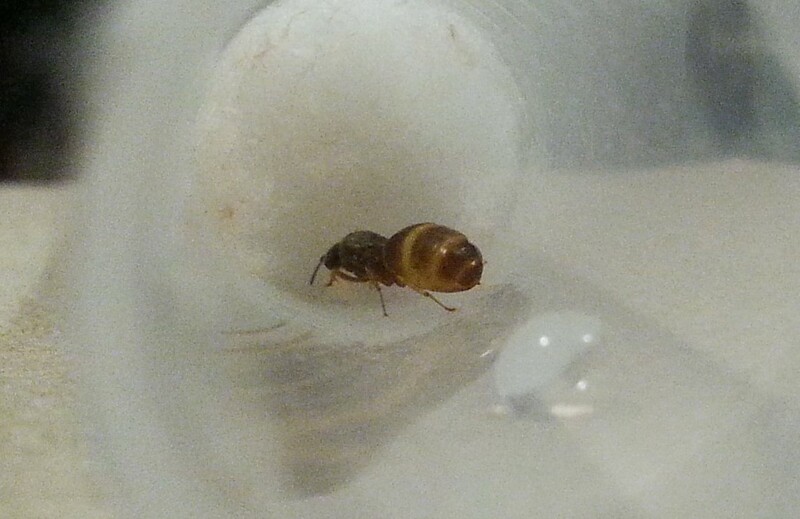 What isn't good news is that my two Lasius neoniger queens are lacking larvae. My winged queen has had nothing but eggs for a long time. Any ideas? 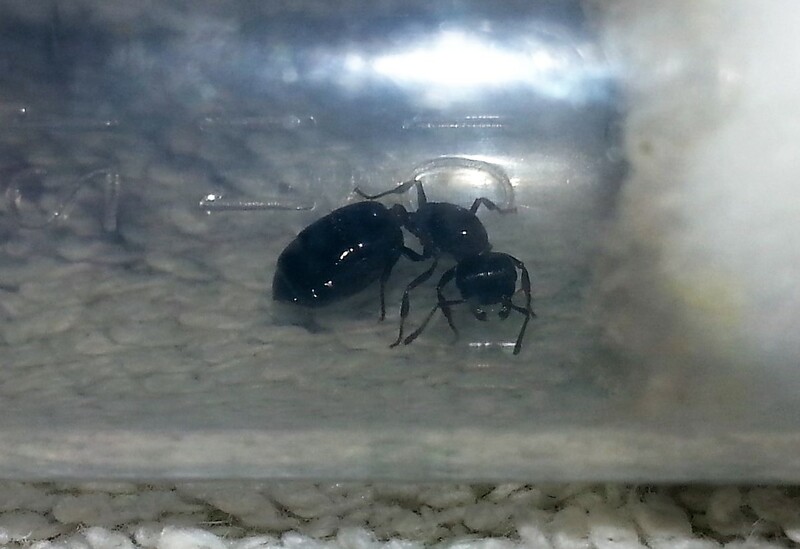 Finally, Last weekend I caught these two Camponotus sp. (I'm pretty sure they are camponotus because that is what is flying now) but I havn't got them completely IDed down to the species yet. I have never seen this ant before so if anyone knows I would appreciate the help. They pull at the cotton a lot and one of them has cotton stands in her serrated mandibles. I tried pulling them off but they are stuck! I decided to leave them both alone for a while until I know more about them. If you have any stabs at the species, I'd love to hear them! I will put out an update if anything cool happens! Wow Will, nice job at your queens! Right now it's December, so there aren't any queens around so i am waiting for late spring and summer. Good luck with your Lasius neoniger and Camponotus colonies! Ooohhh, that's what they were. That is probably why they were such cotton-pullers too. . . nope, she didn't make it to Winter. Thank you! I woke up my 80-member Formica colony a few weeks ago and they have been doing fine. The 4 queens are not producing eggs yet, but they probably will soon. I woke up the rest of my ants yesterday. I will feed them their first meal in about 3 months soon. Good luck catching queens this year! 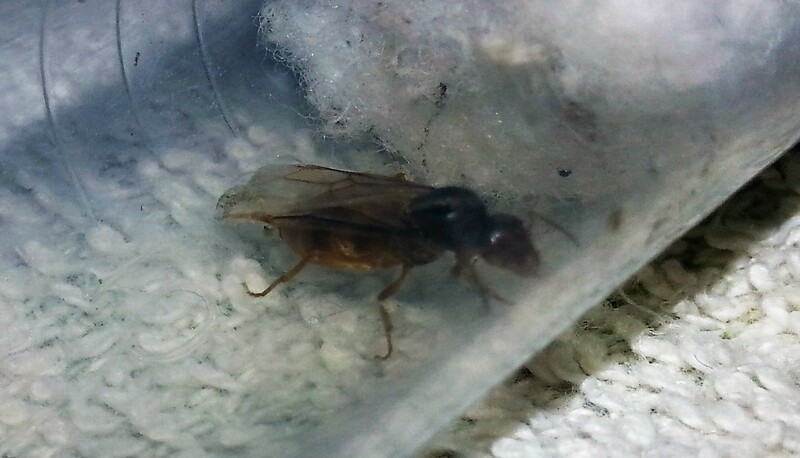 I just caught a crematogaster cerasi colony yesterday.